Bible & Spade. Chap2: The Early Chapters of Genesis. who included a corps of savants in his Egyptian expeditionary force of 1798.
and most of the booty found its way to the British Museum, where it may still be viewed. and the inscriptions on the idols which had remained dumb for over two thousand years were made to speak. and from the first a very special interest attached to those discoveries which seemed to throw light upon the Bible. and even the Tower of Babel (so it was believed) were found. But to scholars the greatest achievement was the recovery of a whole library of Assyrian books in the palace of Ashur-banipal at Nineveh. but what had been achieved with hieroglyphics must be possible with cuneiform too. Excitement rose still higher when Rassam discovered at Nineveh in 1854 some fragments of an ancient Babylonian legend of Creation strongly reminiscent of that in the Book of Genesis. And when George Smith deciphered in 1871 the beginning of a cuneiform story of the Flood the Daily Teleraph newspaper sent him out to Nineveh immediately with a thousand pounds in his pocket to find the other half of the story. and George Smith's Chaldaean Account of Genesis became a Victorian bestseller. a fact which will excuse the somewhat cursory treatment of the subject here. [e.g. W. H. Bennett, Genesis (Century Bible). and a much later one (P). A similar phenomenon is found in the many Babylonian versions which have come to light. but fragments of far older forms of the legend have been discovered. known as the Sumerian Epic of the Creation and Paradise, of a date perhaps as early as 3000 BC. so that we may well suppose that the archetype of the Creation Story so familiar to us from Genesis is almost as old as civilization itself. The publication of these Babylonian legends has made it abundantly clear that they have a definite blood-relationship with those in the Bible. and many of them have points in common with Genesis. But the resemblances between the Biblical and the Babylonian versions are much more remarkable than that, as we shall see. we should have been forced to notice a distinct Babylonian element in their earliest culture. Yet the differences between the Biblical and the extant Babylonian legends are sufficiently marked to indicate other influences in the development from the original archetype. and Yahuda has produced weighty evidence to show a predominant Egyptian colouring of the literary form assumed by these legends in the Pentateuch. In any case, the religious genius of the Hebrews has raised the original stories to a spiritual and moral level as far above the Babylonian versions as Jerusalem is above the muddy lowlands of Chaldaea. whose central figure is the semi-divine hero Gilgamesh. Beneath the earthâ€”not yet named by name. the bone of contention being Marduk's design to make a world. dividing the new earth and heaven from the destructive waters of Chaos above and below. in the Hebrew word for the 'Deep', viz. Tehom. The half of her he raised up, and made a covering for the heavens. Commanded them not to let the waters out. So the heavens he created. Tiamat in Babylonian legend is frequently represented as a huge dragon, or as accompanied by dragons. [The quotation from Ps.74 appears almost verbatim in the Ras Shamra tablets. See p.87.]. Who will go and kill Labbu? As stars like to them he placed the constellations. Monthly for ever to go forth giving light to the land. On the seventh day the disk shall be half. we find the rudiments of a six-day working week and a Sabbath. The physician shall not heal the sick. On this day all business is forbidden. should have ended by having so little in common'. 'a Day of Peace of Heart for the gods'. but on the whole it would seem that our 'Day of Rest and Gladness' is a distinctively Hebrew institution. [Yahuda gives some striking examples of the use of this phrase in Egyptian. The woman like Nintud in form shall be. When Aruru heard this, she made in her heart a counterpart of Anu. the number of which could doubtless be considerably enlarged if we possessed the former in their entirety. Previous to the discovery of the Sumerian Epic of Paradise it was questioned whether the Garden of Eden had any very close parallel in Babylonian legend [It should be noticed that where there is no risk of confusion we use the term 'Babylonian' in its geographical rather than racial sense.]. There existed indeed examples of the so-called 'Adam and Eve Seal', supposed by some to portray the Fall. On opposite sides of a fruit-bearing tree sit two figures, clothed, and one of them hatted. On the extreme left is a serpent standing on the tip of its tail. where Utnapishtim and his wife assisted by a serpent guard the tree of life against the Hero's depredations. There may, of course, be some remote connexion with the trees of Eden. 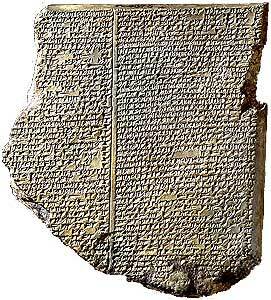 The Sumerian Epic, however, forms a definite link. and the Flood with the sinfulness of Man. The doves were not put to flight. But for some reason ('which is all too briefly defined', says Langdon). Enki became dissatisfied with man, and resolved to overwhelm him in a flood. Tag-Tug [Tag-Tug (Sumerian for. Rest) = Noah (Hebrew for Rest). ], back in the Garden. He shall pluck, he shall eat. The face of Life, until he dies, Shall he not see. My brother, what of thee is ill? Such is the tragic end of the Legend of Dilmun. It is the story of a Paradise on earth, of a forbidden tree, of a Happiness that was lost. But when we look for anything corresponding to the strong moral element underlying the Biblical narrative, we look in vain. and the Babylonian become positively startling, as will be seen by the parallel columns set out below. and fragments from non-Gilgamesh tablets (bracketed) have been inserted. And the LORD saw that the wickedness of man was great in the earth, and that every imagination of the thoughts of his heart was only evil continually. I will destroy man whom I have created from the face of the ground; both man, and beast, and creeping thing, and fowl of the air; for it repenteth me that I have made them. and behold, I will destroy them with the earth. and shalt pitch it within and without with pitch. with lower, second, and third stories shalt thou make it. ... ells shall be designed its breadth and length. the edge of its roof reached 140 ells. I built it in 6 stories, divided it into 7 divisions. Its interior I divided into 9 divisions. Draw for me upon the earth a sketch of it. everything that is in the earth shall die. Upon you shall the gods bring rain ... (making the animals and?) birds a prey to fishes. Upon all that may be there will I bring destruction and annihilation. thou, and thy sons, and thy wife, and thy sons' wives with thee. Bring in hither thy corn, thy possessions and goods, thy wife, thy male and female family, the artisans, cattle of the field, beasts of the field, as many as eat green food. Hide therein the beast of the field, the bird of heaven. with must (?) ... oil and wine I gave drink to the people like as with river water. on the same day were all the fountains of the great deep broken up, and the windows of heaven were opened. changed all light into darkness. went in male and female of all flesh, as God commanded him. with all that I had of silver and of gold I filled it. With all that I had of living creatures I filled it. I brought up into the ship my male and female household. all did I bring into it. I entered into the ship and shut my door. and all the high mountains that were under the whole heaven were covered. so that brother could not see brother. and all the cattle that were with him in the ark. and after the end of an hundred and fifty days the waters decreased. the storm flood and the hurricane swept the land. the storm flood which had fought like an army. And the ark rested ... upon the mountains of Ararat. upon the Mount Nizir the ship laid itself. let it not move away. I knelt down, sat me down, and wept. And he sent forth a raven, and it went forth to and fro, until the waters were dried up from off the earth. and brought her in unto him into the ark. so Noah knew that the waters were abated from off the earth. I let out a dove and set her free. since no place to sit was there, she returned. I let out a swallow and set her free. The swallow flew away, and returned again. I let a raven out and set him free. And Noah went forth ...out of the ark. Then let I out all to the four winds. and offered burnt offerings on the altar. And the LORD swelled the sweet savour. the gods assembled themselves like flies above the sacrifice. and delivered up my mankind to destruction. Why hast thou stirred up a storm flood? Famine might have entered and [devastated] the land. And God blessed Noah and his sons, and said unto them. Be fruitful, and multiply, and replenish the earth. He grasped my hand, led me off. He led my wife off and made her kneel by my side. He took hold of us, while he stepped between and blessed us. at the mouth of the river did they let me dwell. These parallel columns must be left to speak for themselves in a work that does not pretend to be a treatise on Biblical literature. and the actual names of the kings (or dynasties) which reigned before the Flood are preserved in a fairly consistent tradition. And ruled 18,600 years: one king, five cities. Eight kings, they ruled 241,200 years. The Deluge came up upon the land. At Kish there was the rulership, &c.
Ingenious but unconvincing attempts have indeed been made to trace a correspondence between the actual names given respectively in the Babylonian and Old Testament lists. More sensational in some ways than the finding of the Flood tablets was the discovery in 1929 of traces of the Flood itself. which had clearly been left by a deluge of unparalleled dimensions and persistence. C. L. Woolley, Ur of the Chaldees (1929). 'The shafts they were digging went deeper, and suddenly the character of the soil changed. the texture of which showed that it had been laid there by the water. The workmen declared that we had come to the bottom of everything. I sent them back to deepen the hole. The clean clay continued without change until it had attained a thickness of a little over eight feet. and we were once more in layers of rubbish full of stone implements and pottery. 'The great bed of clay marked, if it did not cause, a break in the continuity of history. below it there was a mixed culture. and the flood which caused it must have been of a magnitude unparalleled in local history. and seems to have been submerged by the waters. A Typical 'Tower of Babel. Built of solid brick, and originally surmounted by a lofty temple. The low plains of southern Babylonia are to this day dotted with ruined towers, several of which have been identified at various times with the Tower of Babel. The Biblical description of the building of such towers has been verified by archaeology. They were built of 'brick', which was 'burnt thoroughly'. and 'slime', that is bitumen, 'they had for mortar'. rising in terraces, and ascended by an inclined ramp or stairs to where a temple crowned the summit. 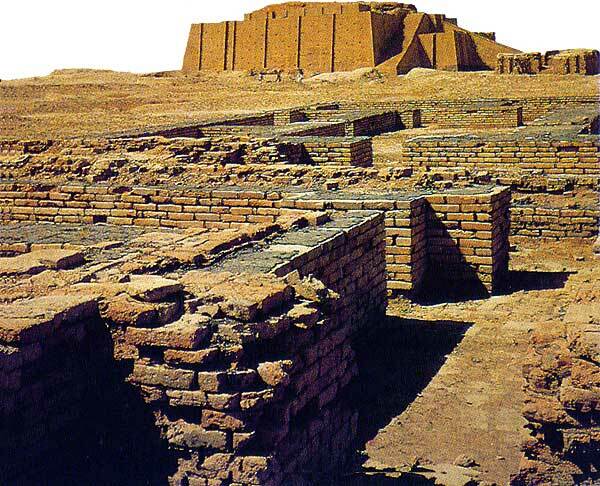 Apart from their religious purpose, these ziggurats, as they were called, served as rallying-posts for the people, lest they be 'scattered abroad upon the face of the whole earth', and doubtless often formed the nucleus of a 'city', to which a 'name' would be given, inscribed in cuneiform upon the tower. Many inscriptions recording the building or repair of such ziggurats have been unearthed. Hammurabi, for instance, tells us that he 'made the summit of the Temple Tower in Uruk high, and amassed provisions for Anu and Ishtar, as the protector of the land, who gathered again the scattered inhabitants of Isin'. Up to the present century the striking ruins of the Birs Nimrud, still standing a mass of jagged masonry 150 feet above the plain, were frequently identified with the Tower of Babel, though it had rivals in the Akerkufor Nimrod's Tower, and in the mound at Hillah which is still called Babil by the Arabs. Today, however, it is generally agreed that the 'Tower of Babel' must have been within the walls of Babylon itself, and that its most probable site is the ruined temple or Etemenanki, whose exact position is now certain. also H. V. Hilprecht, Exploration in Bible Lands (1903). The Etemenanki is nothing much to look at today compared with the Akerkuf or Birs Nimrud. Little remains but the base of a great square tower surrounded by a ditch. But it was once, we need not doubt, a noble edifice whose top almost reached to heaven. and there are many records of its repair. In several of these we find the ominous words 'Its top shall reach the heavens'. so that its top rivalled the heavens. The building of this temple offended the gods. In a night they threw down what had been built. They scattered them abroad, and made strange their speech. â€”a passage which is certainly reminiscent of the Bible story.